Need a new climbing destination? Mike Dobie and Christopher Miller are usually on an expedition bolting it, and Garrett Bradley is the one there to capture the beauty. Check out their bouldering expedition to High Alpine Bouldering in Tibet. On this trip Mike Dobie began a guidebook on Guoliang, and they brought Mad Rock ambassador Will Nagenast to test out some routes. Will Nagenast in Guoliang, China in the gorge. Over my last five years in the country of China, whispers of a climbing area with quartzite sandstone walls would come up. Guoliang, Henan. It is a place that even most people in China have never heard about, much less outside of China. Fellow Mad Rock athletes Chris Miller, Will Nagengast, and I decided to follow the trail of voices to confirm the growing hype, and what we found: nearly endless walls of quartzite sandstone, and the start of what will be a great climbing area in the future. The name Guoliang is actually of a village situated above the cliffs of quartzite which has remained isolated from the rest of China. The residents of the village chiseled (by hand) a tunnel through the cliffs to access the valley below and beyond to the rest of China. After talking with locals, we discovered that climbers have been developing the rock since 2006, primarily contracted climbers envisioning climbing tourism and paid by the park authority. As a result of this development, a local community has slowly been building in the nearby cities of Zheng Zhuo, and this group calls Guoliang their local crag. 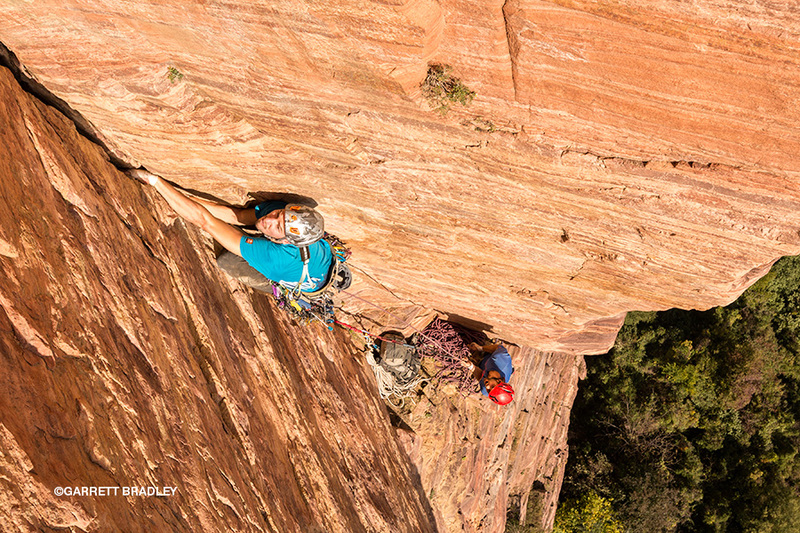 Less than a decade of climbing history exists there, and the area already has nearly 200 routes developed. We immediately went to the established crags and touched the rock, where red hue stone offered slopers, crimps, and cracks in a single pitch. My only distaste were the presence of bolts next to perfect cracks. Contracted route development and park liability for injury and death could explain this “lack of ethic”. Chris and I noticed a splitter high up on one of the walls decided to pursue it based on its position and beauty. Hiking up to the base of the route we folded away bushes and branches of vegetation and found a long forgotten crag of sport climbing routes that the locals didn’t even know about. 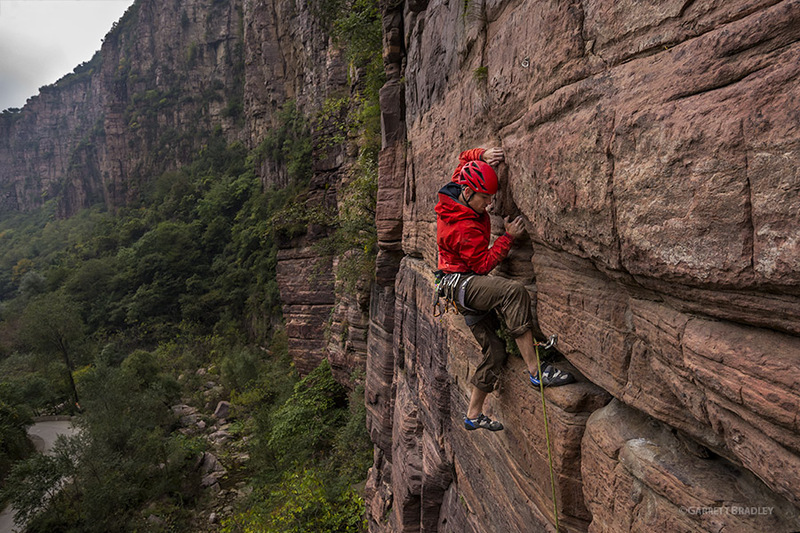 Guoliang turned out to the be best established climbing in the area, offering hard and crimpy sport routes. It was a nice find but our hearts were set on the potential new route. We identified and climbed a corner system out of the crag and ended below a series of roofs that looked a bit tricky to protect. Pulling out my aid climbing weaponry with a bit of crazy I went up these roofs. With presence of a crag below we questioned whether or not the route had been climbed, I thought for sure no human being had touched the roof pitch as rocks and rubble rained down past Chris and I chiseled out my protection with a nut tool. Aid trickery put us on a ledge and into the main crack feature that we had seen from the ground. Halfway up the next pitch, we found a random bolt which put the thoughts of a new route into question. The next pitch was a super nice overhung hand crack and corner that went nicely. Mike Dobie and Chris Miller climb what was thought to be a new route at sunrise in Nanping valley of Guoliang/Wanxianshan National Park, Henan, China. Regarding the bolt, I talked to a few of my Chinese climber friends and found out that the route had been aided in 2007, and not freed yet. The pitch with falling rock was circumnavigated via two pitches of a sketchy looking traverse. This explained the “crispy” rock and sketch gear. So if you are looking for crimpy sport routes, jam cracks, and roof climbing, they are the main allure to Guoliang, and most of the established routes reach into the 5.12 range of difficulty. There is even potential for a wide range into 5.14. 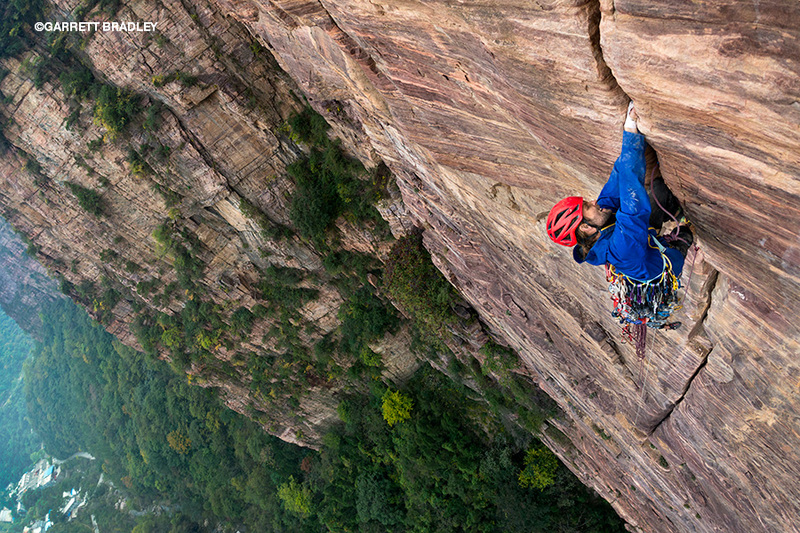 No doubt in time, with more love, organization and traffic, Guoliang will become another world famous Chinese destination for traveling climbers.